What is the scapholunate ligament? The wrist joint is complex consisting of 8 small bones all bound together with many strong ligaments. One important ligament is the scapholunate ligament which holds the scaphoid and lunate bones together. If this ligament is torn it can result in a painful wrist. This is usually sustained during a fall onto the outstretched hand but a violent twisting injury of the hand can be responsible. 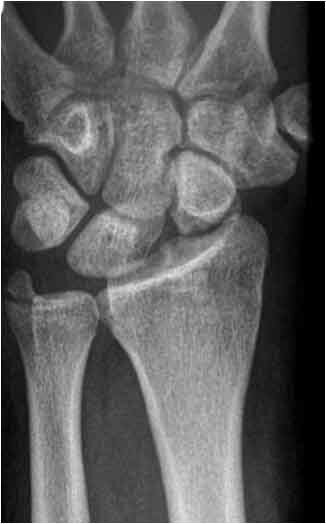 In many ways the mechanism of injury and symptoms are similar symptoms to an acute scaphoid fracture. Wrist arthroscopy (keyhole surgery) - a small telescope is inserted into the wrist joint allowing visual inspection of the ligament. Some injuries of the scapholunate ligament are sprains and the ligament is intact. These injuries need no specific treatment other than rest in a splint initially and analgesic medication. Usually a complete recovery is expected but it can take 18 months or so for the symptoms to resolve. Ligament repair. In an acute injury the ligament can be repaired as a day case operation either using regional or general anaesthesia. Small wires are usually inserted into the wirst joint to hold the bones still while the ligament heals. A wirst cast is worn of 8 weeks, after which the wires are removed and mobilisation permitted. Figure 3: x-rays showing the appearence after repair of the ligament using smooth wires to hold the bones together whilst the ligament heals. Ligament reconstruction. The ligament is best repaired within 6-8 weeks of the injury. After this it is often not possible to repair it and a reconstruction is required. There are several ways of performing this which commonly uses a tendon, similar so the way knee cruciate ligaments are reconstructed. The postoperative management is similar to that following a ligament repair. 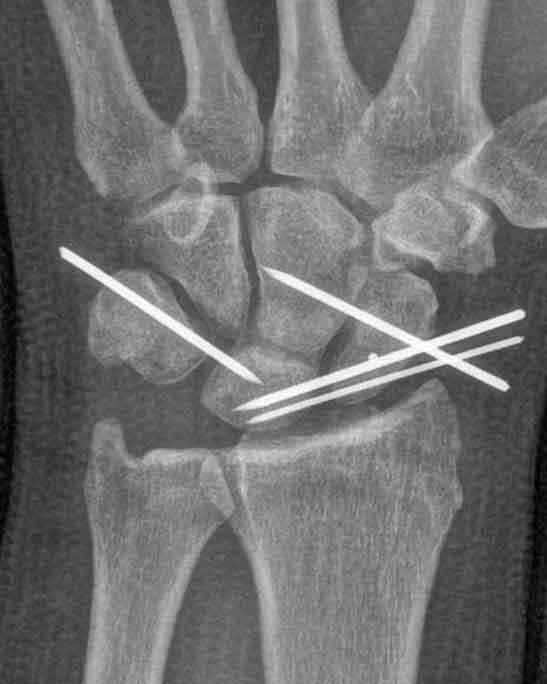 It is accepted that most patients develop wrist arthritis after this injury. Whilst the arthritis will be visible on x-rays, it does not follow that symptoms will inevitably develop and it is common for patients not to have any problems. If the arthritis develops (called a scapholunate advance collapse or SLAC wrist) treatment is available, much like that described for scaphoid non-union. 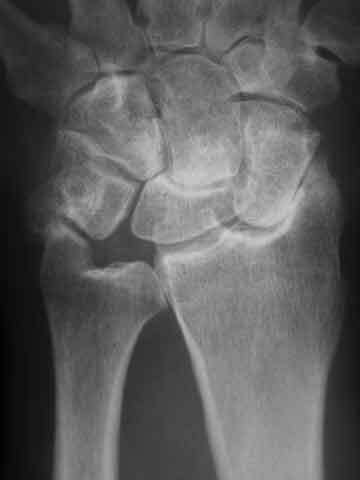 Figure 4: Wrist arthritis from a long-standing scapholunate ligament repair (a SLAC wrist). Note the loss of space between the scaphoid bone and surrounding bones. This is due to loss of the joint cartilage.